I first encountered this monumental ship about one year ago, while on the way to a food palor after another exploring trip to Philly. I thought I was dreaming. There she was, as if the Titanic never sank but put secretely asside to haunt the present, a modern “Elizabeth Dane”. Naturally, the beauty was behind a steel fence, and -being part of a port- entering the premises could have been interpreted as act of terrorism (welcome to the free world! ), thus it was clear that sneaking-in urbexer style was not an option. After some research I identified the Conservancy (see also below) and contacted them in order to get a photo permission. Almost expectedly, it was not an immediate home run. I was told that it is unsafe to go there etc., the usual “explanations”. However, after I suggested that my photos could be used for e.g. raising money I was told that it was planned to organize photography workshop onboard the ship in the not too far future. And indeed, after a couple more weeks, it happened. 20 enthusiasts got the opportunity for about three hours to the belly and decks of the SS United States, and I am proud to present the results on my website today. SS United States is a luxury passenger liner built in 1952 for United States Lines, designed to capture the trans-Atlantic speed record. Built at a cost of $78 million, the ship is the largest ocean liner constructed entirely in the US (it is indeed larger than the Titanic), the fastest ocean liner to cross the Atlantic in either direction, and even in her retirement retains the Blue Riband given to the passenger liner crossing the Atlantic Ocean in regular service with the record highest speed. Her construction was partially subsidized by the US government, since she was designed to allow conversion to a troop carrier should the need arise. United States operated uninterrupted in transatlantic passenger service until 1969. To minimize the risk of fire, the designers of United States used no wood in the ship’s framing, accessories, decorations, or interior surfaces. Fittings, including all furniture and fabrics, were custom made in glass, metal, and spun glass fiber to ensure compliance with fireproofing guidelines set by the US Navy. Specially commissioned artwork included pieces by fourteen artists, including Gwen Lux. Although the galley did feature a butcher block, the clothes hangers in the luxury cabins were aluminum. The ballroom’s grand piano was of a rare, fire-resistant wood species—although originally specified in aluminum—and accepted only after a demonstration in which gasoline was poured upon the wood and ignited, without the wood itself igniting. The construction of the ship’s superstructure involved the greatest use of aluminum in any construction project to that time, and posed a Galvanic corrosion challenge to the builders in joining the aluminum structure to the steel decks below. The significant use of aluminum provided extreme weight savings. United States had the most powerful steam turbines of any merchant marine vessel, with a total power of 240,000 SHP (shaft horsepower) delivered to four 18-foot (5.5 m) diameter manganese-bronze propellers. This gave her the greatest power-to-weight ratio ever achieved in a commercial passenger liner, before or since. The ship was capable of steaming astern at over 20 knots (37 km/h; 23 mph), and could carry enough fuel and stores to steam non-stop for over 10,000 nautical miles (19,000 km; 12,000 mi) at a cruising speed of 35 knots (65 km/h; 40 mph). By the late 1960s, the market for Transatlantic travel by ship had dwindled. Queen Mary had been retired in 1967 and Queen Elizabeth in 1968. United States was no longer profitable and thus in 1969, the shipping line decided to withdraw her from service. After a few years, the ship was relocated to Norfolk, Virginia. Subsequently, ownership passed between several companies. In 1978, the vessel was sold to private interests who hoped to revitalize the liner in a time share cruise ship format. Financing failed and the ship was put up for auction by MARAD. In 1979, Norwegian Cruise Line (NCL) was reportedly interested in purchasing the ship and converting her into a cruise ship for the Caribbean, but decided on purchasing the former SS France instead. During the 1980s, United States was considered by the US Navy as a troop ship or a hospital ship, to be called the USS United States, but this plan never materialized. In 1984, the ship’s remaining fittings and furniture were sold at auction in Norfolk. For example, one of the ship’s propellers is now mounted at the entrance to the Intrepid Sea-Air-Space Museum in New York City. In 1992, a new consortium of owners purchased the vessel and had her towed to Turkey and then Ukraine, where she underwent asbestos removal in 1994. The interior of the ship was almost completely stripped during this time. No viable agreements were reached in the US for a reworking of the vessel, and in 1996 United States was towed to her current location at Pier 84 in South Philadelphia. 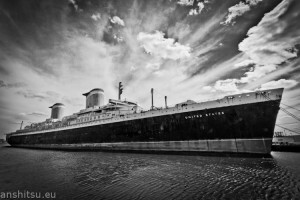 In 1999, the SS United States Foundation and the SS United States Conservancy (then known as the SS United States Preservation Society, Inc.) succeeded in having the ship placed on the National Register of Historic Places. In 2003, Norwegian Cruise Lines purchased the ship with the intention to eventually put the ehip back in to service, however, after various prospected attempts NCL concluded that such endeavor will not work for them and put the ship up for a scrapping bid. However, on 1 July 2010, the SS United States Conservancy struck a deal with Norwegian Cruise Line to buy SS United States from them for a reported $3 million dollars, despite a scrapper’s bid for $5.9 million. Since then, various plans of refurbishing and repurposing the ship are under discussion, one being to place the ship in her original home port of New York as a stationary attraction. One can only hope that this part of nautic history can and will be preserved!